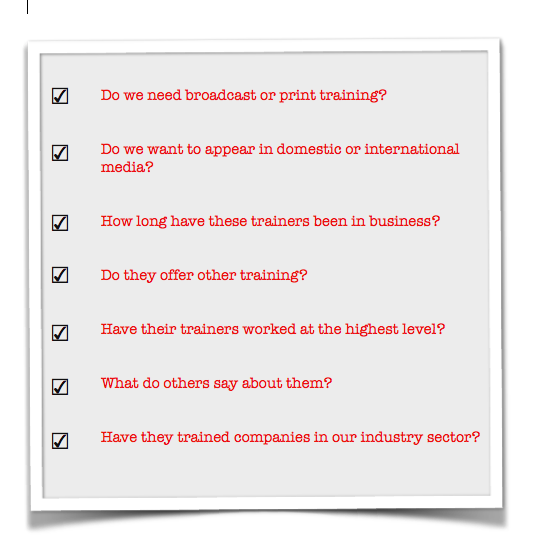 AB BUSINESS TRAINING » How do you choose the right media trainer? How do you choose the right media trainer? WHEN Prime Minister Theresa May was interviewed recently on television, there seemed to be clear signs of specific media training. We would also say it seemed the wrong sort. Afterall, when your interview is lampooned on the BBC’s satirical show Have I Got News For You (6’26), you know it’s backfired. So how do you choose the right media training, the sort that suits your needs (or your clients’ needs, if you’re a PR agency)? Every media trainer offers something different and it’s important to ensure any difference matches what you want. Let’s face it, if you wanted to learn Spanish, you wouldn’t go to a teacher who spoke only Portuguese, on the basis those languages have quite a lot in common. A media trainer who offers roughly what you want is not good enough. Decide in advance which sections of the media you or your delegates most want to appear in. If that’s trade publications or consumer magazines, training focused solely on TV or radio interviews is a waste of time and money. Look for a media trainer that specialises in print scenario role-playing, which includes giving you a written-up article based on those scenarios, so you can see what quotes were selected and which were left out – and crucially, why. This sort of specific print training is invariably the most illuminating and valuable for those who expect to talk to the Press or online publications. Use trainers with experience in your sector. If, for example, you’re a pharmaceutical company or an international airline, it makes sense to look for a training company whose trainers have reported on health or travel stories. They should have the insight and industry knowledge to ask the most informed and probing questions during practical exercises. Think about your audience – is it domestic or international? If you’re a multinational company that wants to secure media coverage say, in Africa or Australia, consider using trainers who have worked there as journalists and/or have run training there. That way, they’re likely to have a better understanding of the local media and how journalists operate in those countries. If you Google “media training,” nearly half a million results come back. Some of those companies have been training successfully for years, others might have set up last week. So do some “digging’ to find out how long they’ve been about, what sort of clients they’ve already trained, how much of their business is “repeat work” and ask for genuine feedback. Any decent media trainer knows they’re only as good as their last testimonial. Think “trust”. You might want your spokespeople to be trained to talk about some very sensitive issues that are currently confidential. A media trainer with a long, successful track record could indicate integrity and discretion. Look beyond basic media training. If you’ve gone to a lot of trouble to find an effective media trainer, it makes sense to see what else they have to offer, because you might want to move on to crisis management training, presentation skills workshops, social media training etc… But equally you don’t want a “jack-of-all-trades”. Again, ask for evidence that their delegates have spoken at conferences, appeared on prime time news programmes, been featured in newspapers etc..
Media training should not be seen as an expense, but as an investment in creating the best possible media performance for you or your clients. “Backing the wrong horse” might not mean you fall at the first fence, but it could easily mean you finish way down the reputation management field, compared to your competitors. Thankfully, the tips above should make the job of picking a great provider that much easier and could put you on course to a champion performance.